August 7, 2012: Anyone who's ever seen a noctilucent cloud or âNLCâ would agree: They look alien. The electric-blue ripples and pale tendrils of NLCs reaching across the night sky resemble something from another world. 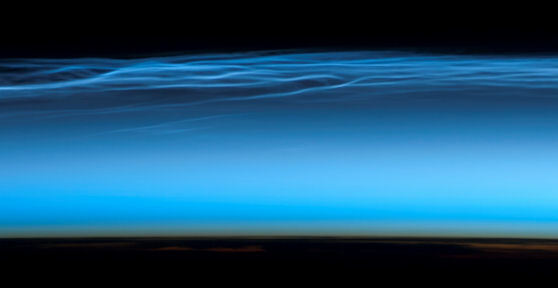 Noctilucent clouds are a mystery dating back to the late 19th century. Northern sky watchers first noticed them in 1885 about two years after the eruption of Krakatoa. Ash from the Indonesian volcano caused such splendid sunsets that evening sky watching became a worldwide pastime. One observer in particular, a German named T.W. Backhouse who is often credited with the discovery of NLCs, noticed something odd. He stayed outside longer than most people, long enough for the twilight to fully darken, and on some nights he saw wispy filaments glowing electric blue against the black sky. Scientists of the day figured they were some manifestation of volcanic dust. Eventually Krakatoaâs ash settled and the sunsets faded, but strangely the noctilucent clouds didnât go away. Theyâre still present today, stronger than ever. Researchers arenât sure what role Krakatoaâs ash played in those early sightings. One thing is clear, however: The dust behind the clouds we see now is space dust. 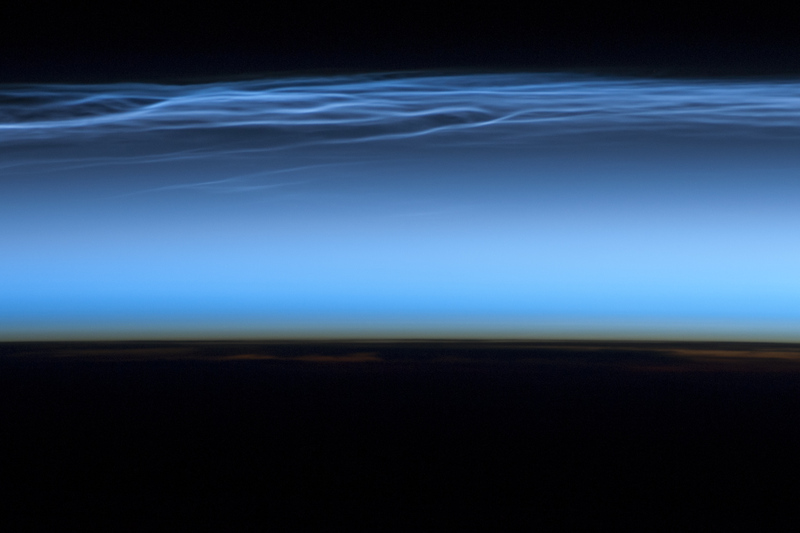 Astronauts on board the ISS took this picture of noctilucent clouds near the top of Earth's atmosphere on July 13, 2012. In the 19th century, NLCs were confined to high latitudesâplaces like Canada and Scandinavia. In recent times, however, they have been spotted as far south as Colorado, Utah and Nebraska. The reason, Russell believes, is climate change. One of the greenhouse gases that has become more abundant in Earth's atmosphere since the 19th century is methane. It comes from landfills, natural gas and petroleum systems, agricultural activities, and coal mining. 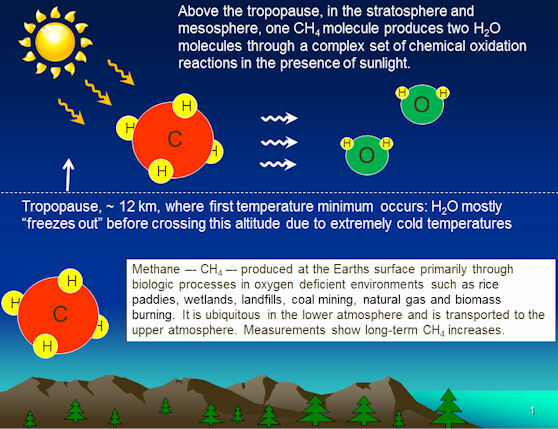 A graphic prepared by Prof. James Russell of Hampton University shows how methane, a greenhouse gas, boosts the abundance of water at the top of Earth's atmosphere. This water freezes around "meteor smoke" to form icy noctilucent clouds. Russell explains: "When methane makes its way into the upper atmosphere, it is oxidized by a complex series of reactions to form water vapor. This extra water vapor is then available to grow ice crystals for NLCs." If this idea is correct, noctilucent clouds are a sort of "canary in a coal mine" for one of the most important greenhouse gases. And that, says Russell, is a great reason to study them. "Noctilucent clouds might look alien, but they're telling us something very important about our own planet." when the Sun has dipped 6o to 16o below the horizon. If you see luminous blue-white tendrils spreading across the sky, you've probably spotted a noctilucent cloud. Although noctilucent clouds appear most often at arctic latitudes, they have been sighted in recent years as far south as Colorado, Utah and Nebraska. NLCs are seasonal, appearing most often in late spring and summer. In the northern hemisphere, the best time to look would be between mid-May and the end of August.